Why does Reading with Rover Work? A study in 2002 by Karen Allen, PhD, a researcher at the State University of New York at Buffalo showed that the presence of dogs lowered people’s blood pressure while they read aloud to a dog. According to the study, published in the September 2002 issue of the Journal of Psychosomatic Medicine, this research demonstrates “that pets can buffer reactions to acute stress as well as reduce the perception of stress.” One reason Allen believes this is true is because animals are not seen as judgmental. Reading With Rover Goes to College! As college students gear up for peak stress season — finals — many are finding comfort in man’s best friend, right on campus. Reading with Rover is proud of our ongoing partnerships with many of the universities in Washington state. A growing number of colleges have become aware of the benefit of our Reading with Rover D.R.E.A.M teams and the incredible amount of stress relief a student feels when it’s “all dogs on deck” that day! students need a break from the pressures of school. And because the programs are typically volunteer-based, they usually don’t cost colleges any money. The health benefits of dogs are well-documented. Petting a canine companion can help lower blood pressure and help ease depression. People with heart disease who own dogs tend to live longer than those with the same ailments who don’t own a dog. And pets help decrease stress by lowering levels of the stress hormone cortisol, and increasing levels of the neurochemical oxytocin, the love hormone. We are overwhelmingly popular on college campuses and love our college visits! Indeed there are numerous articles written which document the direct link between childen reading and listening dogs. The dogs involved in the Reading with Rover program help turn the reading environment into a non-threatening place where children can read for the fun of it! There is no risk of being embarrassed when he/she mispronounces a word, reads at a slow speed or does not comprehend the exact meaning of sentences. At Woodmoor Elementary School (just one of our current ‘read’ locations), the Reading with Rover program is showing great results. Kids are more excited about reading because reading to a dog is more fun. The kids range in age from 7 to 12 years old and most join the program reading below grade level or have self esteem issues and have been identified as at-risk youth. They are pre-selected by the wonderful reading staff at Woodmoor Elementary School for participation in the Reading with Rover program. If you would like to read more about ongoing reading programs in which Reading with Rover D.R.E.A.M. 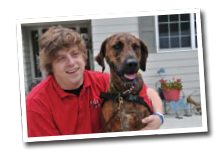 dog teams or Pet Partners® are involved, please contact us directly or visit the Intermountain Therapy Animals website.